September is National Microchipping Month. – all dog owners need a Certificate of Registration to prove this. ‘Cara’ out for a run with Fiona Hederman, Rathmines, Dublin – Picture by Dylan Vaughan. If you haven’t microchipped your dog, please speak to your vet. 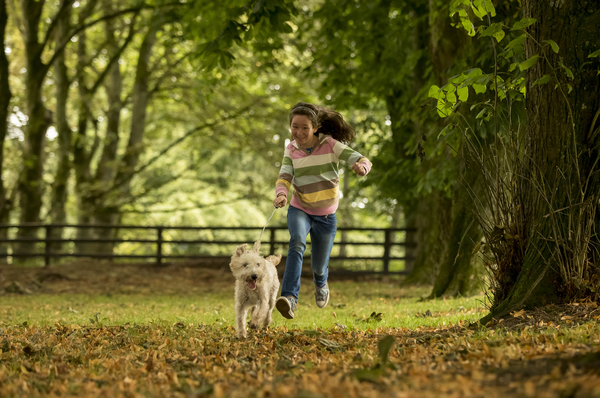 Dog owners across the country can avail of free microchipping at participating veterinary practices as part of a Nationwide Microchip Awareness campaign. For a nation-wide list of participating vets see www.ncm.ie or on Facebook at National Chipping Month. – All puppies born from 1st of June 2015 onwards must be microchipped by the age of 12 weeks or before they are moved from their birthplace, whichever is earlier. Make sure you have a record of vaccination details. It’s advisable to ensure all paperwork is in order BEFORE bringing children to see a new pet. Where a puppy or dog changes ownership, the change of contact details for the microchip must now be signed off by both the seller and the purchaser. “The compulsory microchipping of dogs and new certification of the microchipping process with an authorized database such as fido.ie will have big animal welfare benefits and is good for dog owners too” says Mark Beazley, Executive Director, Dogs Trust. “This will help to reduce the stress and trauma for animals and for owners when a dog is lost. Where compulsory microchipping of dogs has been introduced in other countries there has been a drastic reduction in the number of animals destroyed in pounds because their owners can not be identified,” said Mr. Beazley. According to figures released by the Dept. Of The Environment almost 3,000 dogs were put to sleep in Irish pounds in 2014, many of these were healthy, well-adjusted pets. “If you love your dog you will want to do everything possible to protect it from getting lost; and to get it home quickly if it does get lost,” said Mr. Beazley. On 12th June, 2015, Simon Coveney T.D. announced www.fido.ie to be the first Irish database approved for microchipping registration under the new legislation. Veterinary surgeon Finbarr Heslin from www.fido.ie says that there have been incidences of puppies being transported into Ireland from Eastern Europe. “They can be sold here or more commonly we see them exported out of Ireland as ‘Irish puppies’.